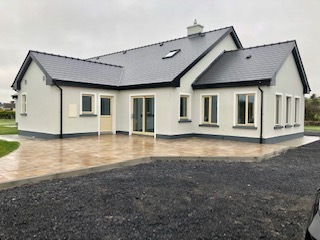 Newly constructed 4 bedroom detached property with Block Garage occupying a large mature site circa 1.5 acres located in close to the village of belcarra and withn easy commuting distance from Castlebar town & minutes drive from the renowned Castlebar Golf club. 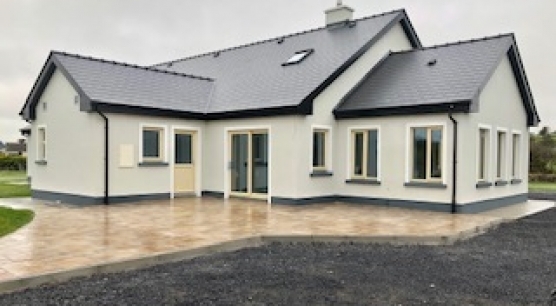 This property has been constructed to a very high Standard.With an eco friendly design the focus is on energy efficiency with the objective of lower running cost and future savings. Bearing this in mind the specification has been designed to give the home owner their dream home. Architecturally designed spacious layout, Fully energy efficient design with the objective of lower running costs, and comes with a Eco Friendly Air to Water heating system. This property comprises of well proportioned living space throughout being 2,500 sq ft with 4 bedrooms 2 of which are En-Suite , Kitchen/dining, Sitting room, Utility and downstairs WC. There is the added option of 1600 sq ft first floor attic conversion.